Join us and explore the Wetlands with Yorta Yorta on this unique discovery tour. 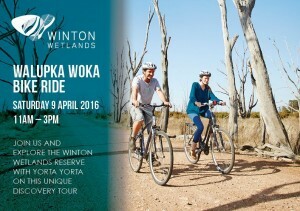 This special event will give cyclists of all ages a rare opportunity to ride through the Winton Wetlands, spend time with Yorta Yorta people, discover Aboriginal artefacts and hear stories of the site’s significance to the Yorta Yorta people. Winton Wetlands is a tranquil, spiritual location in the heart of north east Victoria (2 hours north of Melbourne). A natural food bowl, the Wetlands were a rich source of food for many different Aboriginal clans within the traditional lands of the Yorta Yorta Nation and the site continues to be of considerable social, historical, scientific and spiritual value to its traditional owners. The area was known by Indigenous peoples as Mokoan, an extensive ephemeral wetland system which was inundated seasonally. The area was rich in traditional food sources and provided water, shelter and medicine for significant Indigenous communities. Events of scale, such as corroborees, trade and other traditional ceremonies brought family groups together at this traditional meeting place. This spectacular ride will be culturally enlightening, spiritually uplifting and lots of fun. The ride will start at 11am at Green’s Hill with a traditional Welcome to Country and Smoking Ceremony. There will be a choice of 10km and 20km routes and riders will fuel up mid-tour with a delicious lunch of contemporary Indigenous dishes. Winton Wetlands has been a part of the North East community for thousands of years and is now a wetland restoration and social renewal project unlike any other. This unique event is part of Winton Wetlands exciting Autumn program which will offer visitors opportunities to explore and experience the Wetlands through new eyes.